It's no secret that we are quite fond of Italian food so when Grace raved about her new local Bottega it certainly got our attention. Soon enough a date was arranged and we joined Grace and K for dinner. 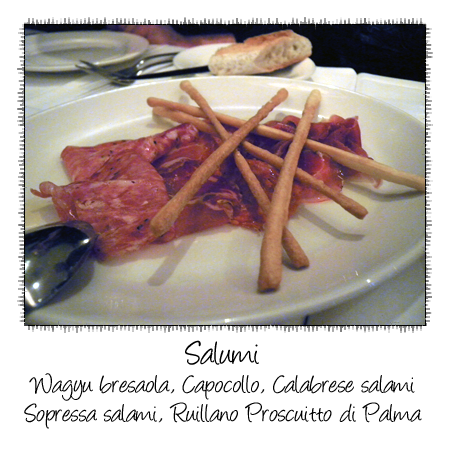 Two sizes are available and this is the larger one - a very good selection of wonderfully fresh cured meats served with freshly baked grissini. 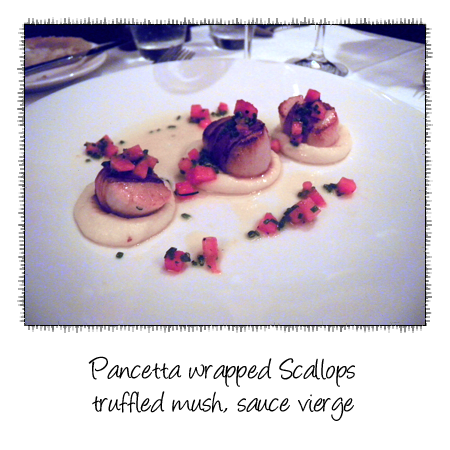 An attractive dish that tasted as good as it looked - the pancetta was crisp yet the scallops were just cooked, still retaining that transculent quality we love. 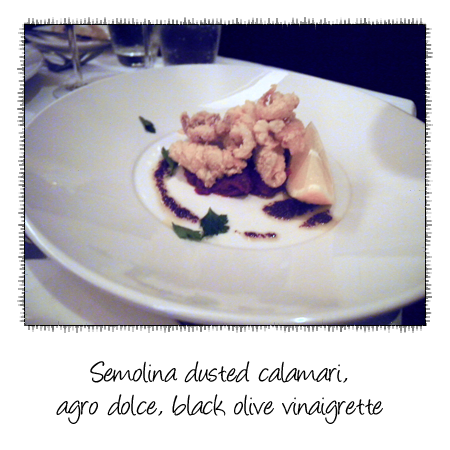 A hint of truffle lingered in the silken mash. Vitello Tonnato, it's one of those dishes that if it's done well it's brilliant but more often than not it tends to dissapoint. This dish falls happily in the successfully done category. The tonnato sauce was especially good. 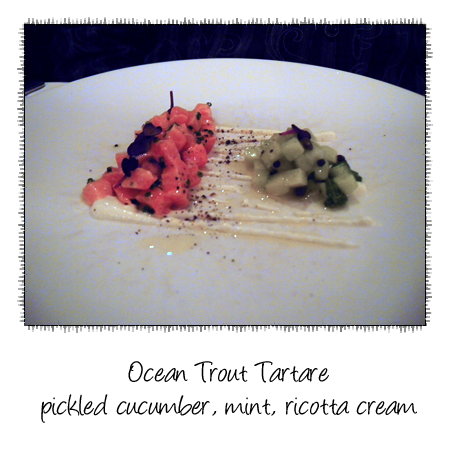 The ocean trout still retained that lovely buttery texture. We were all quite impressed with K's calamari - lovely crisp exterior surrounding an almost butter soft calamari - some of the most tender calamari we've had in a while. 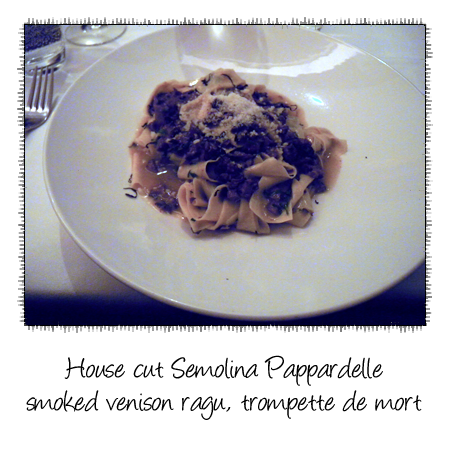 Gourgeously silky pasta cooked correctly and served with an equally lovely ragu. 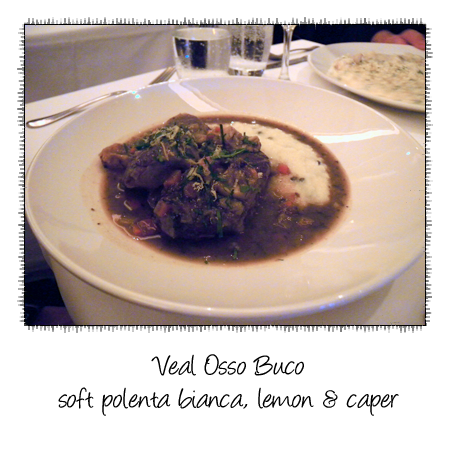 Grace and Paalo both opted for the Osso Buco - the soft white polenta was excellent, smooth and creamy. 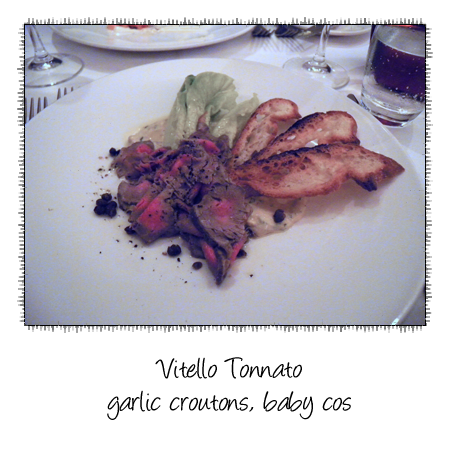 The veal was tender, just falling off the bone. 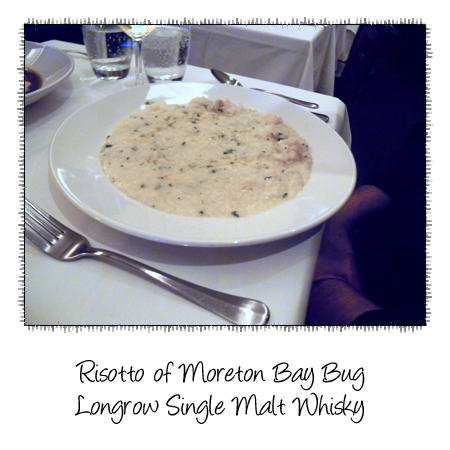 The combination of moreton bay bug and malt whisky attracted K to this dish and it proved to be quite an intriguing combination. I was actually surprised by just how much of those whisky characters remained, those smoky, malty notes almost accentuating the creaminess of the rice. 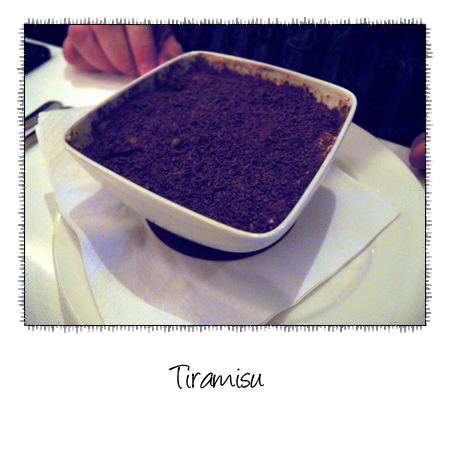 The tiramisu was well done and generously propotioned. 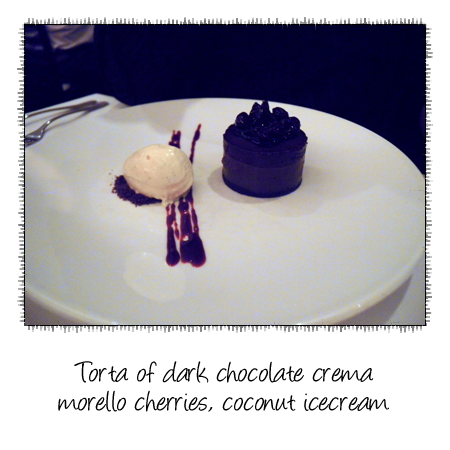 I especially liked that the filling wasn't overly sweet and we all loved that bitter chocolate icecream. It may have looked a heavy option on paper but it was surprisingly delicate. 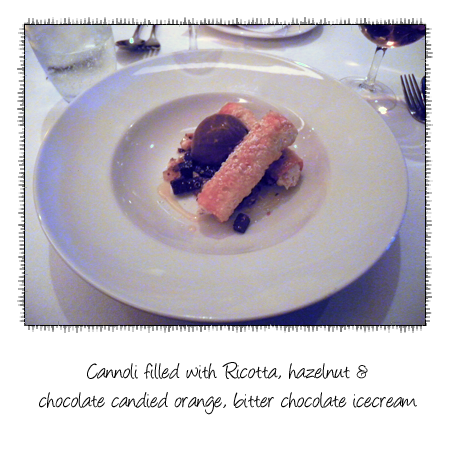 The only downside with dessert was solely our fault and it was our selection of dessert wine. Now we absolutely love the italian wine, Brachetto d'Acqui and while none was on the menu, they did have a local drop, 2008 Pizzini Brachetto. I was hesitant to order but Paalo being the adventurous one decided he'd like to try it, so we dutifully ordered a bottle. I can't say this any more clearly but that wine was a joke and an insult to Brachetto d'Acqui. Apart from that blip, the evening went down pretty well and I can fully understand why Grace likes the place so much.